This year, we made public forms and instructions the focus of the assessment. The Center worked with CPoint Consulting to conduct the Report Card analysis and prepare the results. We asked each department to submit one (or two, as desired) forms and instructions carrying a high number of annual public burden hours. This figure is the product of the estimated average time it takes someone to fill out the form and the number of people submitting the form annually. This selection of forms and instructions we graded collectively represent millions of hours of individual users’ time each year. 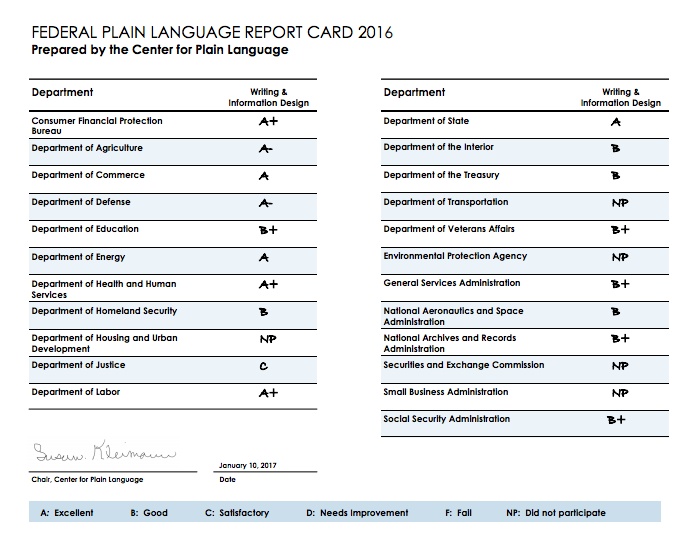 Chip Crane, Center for Plain Language board member and Report Card Lead, briefed agency reps at a Federal PLAIN meeting in June to help departments understand the requirements and start preparing their materials. In August, he and Susan Kleimann, the Chair of the Center for Plain Language, delivered a webinar for agency representatives. Chip covered the submission and grading process, and Susan trained agency reps on qualities of effective forms. Federal PLAIN (Plain Language Action and Information Network) is an interagency working group designated to guide agencies in plain writing. PLAIN also often acts as a liaison to the Center for Plain Language to promote clear government writing. See the PLAIN website: www.plainlanguage.gov. Submissions for this year’s ClearMark Awards are due Jan 31. We encourage agencies—especially those earning high marks—to nominate their documents. See the Center’s website for details.